Each year millions of computers and accessories are manufactured throughout the world. Highly toxic pollutants used in computer production are released into the environment. As obsolete computers and their accessories are retired to make way for new ones, they add to the already high levels of toxic waste in the landfills. In nature, all waste converts to food. The concept that commercial production and product consumption cycles could evolve to be as efficient as nature is one of the many ideals of Ecological Design. Using this concept, I have designed a keyboard that reduces the amount of harmful toxins released into our biosphere. 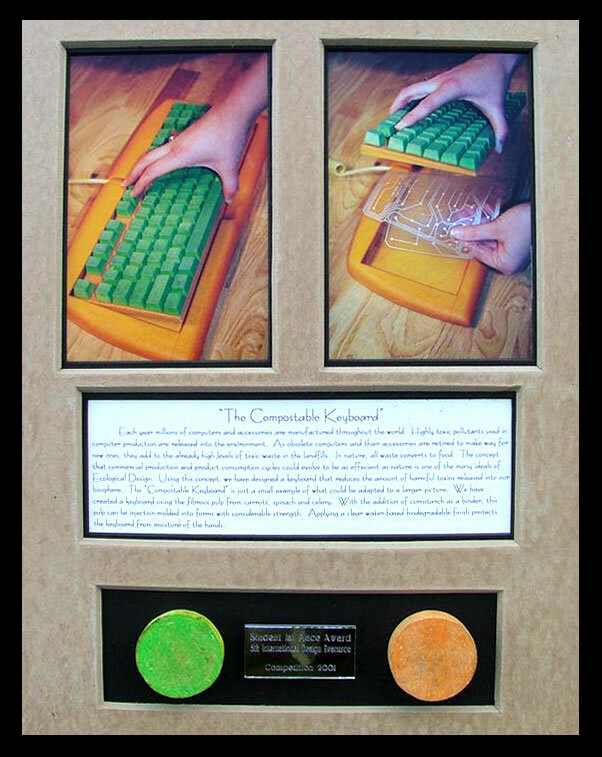 The "Compostable Keyboard" is just a small example of what could be adapted to a larger picture. I have created a keyboard using the fibrous pulp from carrots, spinach, and celery. With the addition of cornstarch as a binder, this pulp can be injection molded into forms with considerable strength. Applying a clear water-based biodegradable finish protects the keyboard from moisture of the hands.